Tubas and tuba players have influenced my life in significant ways. I suppose I should begin at the beginning. My home town was Braintree, in the County of Essex, a market town, where local villagers congregated on market days. Although a rural town, Braintree boasted some quite significant factories which had grown in importance in the the early twentieth century. It also had a brass band with the imposing title of Braintree Town Silver Prize Band. The provenance of the silver prize, if there had ever been one was lost in the mists of history, but the band prospered and, more importantly, my father was the band secretary. He played what he called the "double-B". This rather strange-looking metal object used to stand in a corner of what was known as "the front room." For reasons which I never understood, this room was only ever used on high days and holidays and was where the rather large and shiny thing stood. My father took great care of it, even occasionally polishing it I eventually discovered that it was called a bass. It was, apparently, a musical instrument and my father played it in the band, although I never heard it played in the house. It had what dad called a mouthpiece, which stuck in a pipe which was about 18 inches above the floor. I should explain that this bass was upside-down, and had the enormous end, which dad called a bell, on the carpet. I once tried to make a noise on it, when I had been shown how, and found that I could only get a kind of mangled bubbling out of it. When I eventually saw my father, dressed in a strange bright green jacket decorated with bits of gold, holding and actually making various sounds with this fearsome-looking machine the other way up, and making those odd-looking objects (valves, he called them) go up and down, it was an absolute revelation. At four years old, I was fascinated. Dad did not play any tunes, but seemed to add to the general noise that the Braintree Town Silver Prize Band was happily producing. My father was, of course, the band secretary and eventually became the custodian of all its instruments. He was always industrious and resourceful and had built a very solid garden shed where all the band instruments were kept, when the band had temporarily ceased to function. We eventually owned a radio set and listened to all kinds of music. The biggest compliment that dad could give to any music was to say that it would go well on the trombone. I had no idea what that might be, and obviously asked him, for one day he produced a long brown case from the carefully stacked instruments in the shed ,extracted some odd-looking lengths of tube assembled them and put this trombone into my rather small hands. By then I would have been about seven years old. From this first brief taste of a brass instrument, I had to wait several years really to make its acquaintance until, when I was 10, in 1941, we moved to the nearby city, Chelmsford. My father had taken a job as an insurance agent (as he had the required bicycle) for the Salvation Army and we as a family all became Salvationists, more or less overnight. For me, the big attraction was that they had a boy's band as well as a (very large - 60 members) men's band. I was given a trombone! Somehow, I became proficient in a very short time and was shown the basics of how to read music. Within a few weeks I was playing in what was called the YP band. I had meanwhile taken up the violin at school, which also helped my musical awareness. Over the ensuing years, my father played various tubas in various bands. In 1943 we moved to near Doncaster, South Yorkshire, and took up with the local SA band there. After less than a year, we were back south, at Luton, one of the busiest industrial cities in the south. Again there was another SA band for me and my father. My tromboning progressed and we both played in the men?s band, special permission having been granted for me at the age of 13. By the age of 16, I had rebelled against the rather restricting attitudes of the "Army" and played for a time with the then famous Luton Band. This was a busy time, with regular broadcasts , concerts and contests. The 4 tubists were all large and middle-aged. The most senior was in his 60's and had actually, he proudly told me, begun on the Eb soprano cornet and had gradually worked his way down through all the valve-instruments to finish as the No 2 BBb, having also the responsibility for sweeping out the bandroom. As a mere kid, I just absorbed every thing and got on with the playing. I attended the local grammar school which happened to excel in music, passed all the necessary examinations and eventually became at the age of 18, a student at the Royal Academy of Music, commuting the 30 or so miles to London. There was only one tuba student there at the time. After only one year the non-existent trombone lessons (that's another, rather long, story) and the feeling that I was wasting my time caused me to take the first job that came along, as 2nd trombone in the Bournemouth Municipal Orchestra. This was an extraordinarily fine ensemble, mainly composed mainly of elderly former members of the Halle and Scottish orchestras. It was the best possible first job; the conductor, Rudolf Schwarz was far better than such an orchestra deserved I learned more in a few weeks than I had ever learned in my whole life so far. Here the tuba player was Arthur Mason, a shortish, quiet fellow with a distinct Birmingham accent. He had been a soldier and and a postman My main memory of him was that he was a heavy smoker who always carefully brushed away any cigarette ash from his chair and sat on the stage whenever the trombones were needed and he was not. I never heard Arthur offer an opinion about anything. After two years I became the 1st trombone of the CBSO in Birmingham. My new tuba colleague was a larger-than-life character, Maurice Hingott, who like Arthur Mason, played the Boosey EEb tuba, which was then to be found in every brass or military band. He played very loudly, not always in the right place, and seemed very confident. He had long flowing white hair (then a great curiosity) and because of his very strong west-country accent, was known as mangel-wurzel (although not to his face!) The general level of the CBSO was not very good; most of the members having been recruited when it became a full-time job in 1943, when good players were very hard to find. So there were changes made in 1953 and we had a new tubist, Arthur Doyle. Arthur had followed the older British tradition, having been a top-class euphonium player. I had known him in the Luton Band when I was 17 years old. During WWII he had been in the RAF Central Band with the famous John (Tug) Wilson. Many of his RAF colleagues became the Philharmonia Orchestra, by common consent the finest when formed in 1945. Arthur had also worked in the Philharmonia for a short time, so came to the CBSO with something of a pedigree. He was the first British player after Philip Catelinet, for whom it was written, to play the Vaughan Williams Tuba Concerto, in 1954. Arthur played on a smallish Boosey high-pitched Eb instrument that had been cut down by a further semitone to put it in F. By modern standards it was a very small sound, but better than anything anyone had heard before. "Bass's bitter (beer) false teeth, and 60 (cigarettes) a day." He succumbed to the typically old-soldier smoking habit, however, and died of lung cancer in 1963 at the age of 54. The LSO was then in a real fix - there were simply no good tuba players available that we knew about. In those days, such players as there were had come from army bands or even from brass bands. Most had been euphonium players and played small tubas that blended well enough with the small-bore orchestral trombones that were the norm. We had a succession of players who did the job to the best of their ability, which was far from ideal. Most well-respected players were poor by today's standards, but there were some extraordinary characters. My favourite was Francis (Mick) White. I should explain that army nicknames, usually originating from the various regiments, were applied to many musicians, thus Mick meant an Irish, Jock a Scottish and Dai a Welsh regiment. Mick was occasionally to be found in one of the London orchestras. A memorable occasion was when he was deputising (substituting) for the renowned "Tug" Wilson in the London Philharmonic, during their then regular Festival Ballet season. Petrushka was scheduled. Mick had prepared himself well and was looking forward to the event. The big solo "Peasant with Bear" was to be his moment of glory. I should explain that Mick sounded like a stage version of a very old man - he always had a kind of quavery wobble in his voice, which he also carried into his playing. He always had a unique ability to make kind of wobbly glissando effect between any slurred notes. He usually played with a unique rubato style which even by the early 1960's had vanished in professional music. The solo with the clarinet came and Mick dragged it out slower and slower, then breathed a sigh of relief when it had finished. He was obviously very pleased with himself. He leaned over to Gerry McElhone, then the LPO bass trombonist, and asked in his wobbly voice "Howow was that Ge-e-ery?" Gerry replied in his rich Belfast accent, "You were a bar out, Mick." Mick looked astonished and taken aback. "Was I?" he asked. "Which way?" What happened to the dancers is not recorded! In 1962, I had an experience that I shall always remember. During a week when the LSO was recording Mozart or Haydn - no trombones required, therefore no payment - I had been engaged by the Cambridge University Musical Society. Apparently there were no student trombonists around then and I was booked to play. They agreed to pay the same fee as the LSO, so why not? The concert was more notable for enthusiasm than accuracy. A performance of the Strauss 1st Horn Concerto had more split notes from the soloist than I had heard for a long time, if ever! The 4th hornist seemed to me to be at a much better level than any of the others, so I offered him a ride back to London. He was obviously a "pro" player, if rather young. He explained that he was, in fact, a student, asked if I was Denis Wick, to which I replied, "Guilty as charged!" and [he] asked if I would give him lessons. When I protested that I could not really teach the horn, he explained that his real instrument was tuba. I then promised to try to find him a teacher. Next day I was recording the music for a BBC radio play, Arnold Wesker's "Chicken Soup with Barley" with Philip Jones, Alan Civil and John (Tug) Wilson. So I asked Tug if he would consider giving my new friend some tuba lessons. It was difficult to persuade him; more so when I explained that I had only heard him play the horn. Tug suggested another tubist whom I knew to be a particularly poor player, so I reluctantly agreed to try to help my new-found young Cambridge horn-tuba player friend. This eager and tousled young man arrived at my house with a battered Boosey Eb tuba, sat down and proceeded to play the Vaughan-Williams Concerto to me. I was absolutely amazed. Here was playing that was so intelligent and musical, so imaginative and fluent that I could hardly believe my ears. True, there were some extraordinarily unorthodox embouchure changes and tongue-stopped staccato, but I had never heard anything remotely as good. Thus began a 25-year friendship with John Fletcher. A year or so later, in 1963, the LSO spent almost three weeks in Vienna. My trombone colleagues and I decided to spend a morning in the basement of the Konzerthaus, where we were to play our concerts, working together on trios. This was an excellent method of keeping in shape and we always enjoyed it. I remember that we were playing the Beethoven Oboe Trio, which adapts well for three trombones. Suddenly I was aware of what sounded like a section of double basses practising. Unbelievable ensemble playing, absolutely together, with an enormous volume of sound reverberating around the subterranean corridors and open spaces. I looked for the source of the sound and eventually found it. A rather skinny young man playing the biggest tuba I had ever seen. The strange acoustic had something to do with it, but the magnificence of the sound was astonishing to us. So I met the 22-year-old Robert Tucci. Bob had come from the USA to Vienna to study with the local tubist, only to find that he completely outclassed his teacher! Within a short time, he was working and becoming established. We immediately struck up a friendship which has remained for more than 40 years. He showed me his unbelievably vast Holton CC tuba, his breathing techniques and so many aspects of tuba playing that I could only have dreamt about! Bob told me so much about his teacher, Arnold Jacobs, and his teaching methods. I soaked up everything like blotting paper, This was my ideal tuba playing! Of course, it was impossible for Bob to work in the LSO; as a US citizen he could not join our Musicians' Union, which was essential to be able to work in London. When we returned from the tour, I lost no time in passing on my newly acquired tuba-knowledge to John Fletcher. John's embouchure switches moderated and stabilized as I persuaded him to concentrate his energies on tuba playing, and after coming over from Cambridge for about two years, John had become an orthodox tubist - and an amazingly good one. After he had duly collected his degree in Natural Sciences, I thought he should do a postgraduate year at the Royal College of Music. To their everlasting shame and my fury, they refused even to hear him as his first degree was not in music. So I devised a plan. The BBC Symphony Orchestra had finally fired their tubist, when the newly appointed Antal Dorati heard him play; there were to be auditions. Dorati had worked extensively with the LSO and we knew him well. So I spoke with the maestro when he was conducting the LSO, told him I had a protege that wanted to audition and requested that the audition might be as difficult as possible. The reason being this apparently sadistic request was that there would inevitably be several fine guardsmen who would probably impress the audition panel with good technique, but would not have much idea about extremes of range such as Benvenuto Cellini or Ride of the Valkyries or have much, if any, orchestral know-how. John had played in the National Youth Orchestra, had much amateur experience and in any case, was a superb musician. To cut short a long story, John won the audition and became the BBC Symphony Orchestra tubist in 1964, where he remained for four years. 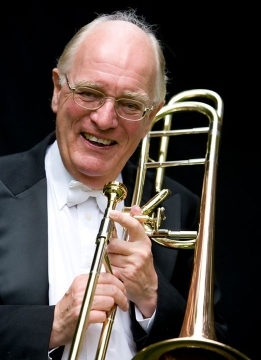 He became the LSO tuba player in 1968 and remained until his sudden premature death, in 1987, at the age of 46. He had eventually bought Bob Tucci's Holton and had become a fine exponent of it. My dream had come true and we were together in the LSO for almost 20 years. The recordings are there to prove it! In about 1964, at about the time of John's BBC audition, Philip Jones offered me some work with his brass ensemble. As usual, I was unable to do it because of LSO commitments, but I was able to recommend John - Philip needed a tuba and John was the only one that could really play. Fletch, as he became known, worked very successfully with the PJBE until his death in 1987. Tuba playing in Britain has changed beyond all recognition in the 56 years since my career began. It is true that there have always been good players on every instrument, but there were very few on the tuba and very little was expected of them in those early days. John Fletcher's legacy has created standards of playing that simply did not exist, even thirty years ago. The omnipresent Boosey and Hawkes/Besson E flat tuba which is such a good compromise, making it possible to cope with any kind of repertoire, is still with us, although more of the top professionals are using some of the excellent five-quarter and six-quarter tubas that are being made by the best German instrument makers. The work that John and I did with mouthpieces to try to cure what he saw as a problem in the dullness of the Besson E flat sound - he called it the "white-bread sound" is still bearing fruit. The most amazing transformation which has been happening gradually over the last twenty five years is the quality of amateur playing. There are now literally dozens of tuba players in brass bands all over the country who are better than most of the professionals of my youth. The staggering brilliance of John Fletcher's virtuosity which can still, thankfully, be heard on his recordings has inspired standards which have exceeded my expectations. For myself, I am proud to seen it happen, and to have played a tiny part in helping to create it.